Wisbech-based Matt McChlery has plenty of strings to his bow. 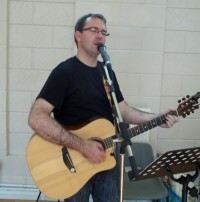 He is a worship leader, singer/songwriter, author (he's written a book about songwriting) and teacher at a primary school. One could add that he also finds time to review albums for Cross Rhythms! As a long-established composer of worship songs he's had several which have been heard around the world through Christian radio and TV though he is the first to admit that none has quite gained the popularity of a worship anthem penned by his great-great-great grandfather, one Sabine Baring-Gould, the Anglican vicar composer of "Onward Christian Soldiers". Matt admitted, "I think the family's quite proud they've had someone in the family that's contributed in that way. From an early age, it's been talked about and mentioned every now and then." Matt was born in Zimbabwe. He reminisced, "My father was a teacher. He started a new school out in the middle of nowhere - from the first brick in the ground. We were out there pioneering, making this school out of nothing. I grew up in a place where there wasn't really a church nearby, so we didn't go much. It was more in my teen years that I started getting involved in church." It was in Matt's boarding school in a little town called Marondera that his interest in music was stimulated. "I was very much involved in singing, choirs, school musicals - that kind of thing. My mother recognised some musical ability in me when I was very young and started me in piano lessons. But I hated them. I tried the guitar once, and my guitar teacher told my mother, 'He's rubbish: it'll never work'. That was that until someone at school said, 'Have you tried the guitar?' With the right encouragement and pointing in the right direction I now play guitar, and I much prefer it to the piano." As it turned out, Matt's Anglican boarding school was also to play a part in the 13 year old McChlery's Christian conversion. He recounted, "I was in the choir with the robes and the frilly collars, because I really liked singing. There was this alternative Christian meeting on a Thursday night called Christian Forum. One of my friends in the dormitory invited me along. There was someone playing guitar, and people were clapping, singing along. I thought this was the weirdest thing I'd seen in my life. But I kept going back, started knowing some of the songs, joining in. Later on in the year, one of the old boys from the school who was now at university in Cape Town had started a band with some of his friends from church called Penguins In Africa. They played on all the beaches in South Africa. Because he was an old boy, they organised to do a gig at the school. I think it was compulsory, but it was brilliant. The music was great, and they had an altar call. They had 10 minutes where they preached the Gospel: 'If you want to know Jesus as your Saviour, put your hand up and we'll say this prayer together.' And I did. God had obviously been working in me for a while leading up to that point, so when that time came I knew what I was doing and was ready to go. That was 1992." Matt was a bright student and won a scholarship to attend Rhodes University in South Africa. After he came back to Zimbabwe he did a postgraduate teaching diploma. Musically, things were developing for Matt as well. He appeared on South African cable television and was heard on local and national radio in both South Africa and Zimbabwe. In 2002 Matt released an independent single, "Jewel Of Africa", which reached the top 10 in the Zimbabwean chart. In 2005 Matt relocated to the UK. He said, "I started off doing Christmas jobs before I found the teaching job. I've ended up at a place called Wisbech Grammar School, and I'm teaching in the junior class there. I purposefully set out to find a lively, life-giving church in my area." That fellowship, King's Church, was key in encouraging him to record some of his worship songs and in 2005 he went into Apple Tree Studios with engineer/producer Phil Goss and recorded the album 'Fly'. The Cross Rhythms reviewer enthused, "In a cut-throat music world, Matt McChlery is up there with the best of them, flying with a fine debut." Speaking about the album today McChlery said, "I still play the title track - not so much in church, but more at outreach events." Looking back on the album, I'd say I was fairly pleased. I had feedback afterwards - people in the music industry - saying it just needing a bit more of my own sound to come through. I saw it as a valuable learning experience, and I've tried to build on it." It was to be five years before Matt had the opportunity to record again. He explained, "I kept on pursuing the songwriting: I recorded a couple of songs on compilation albums that dB Studios in Lincoln put together. I was on 'Released 5' and also on 'Released 8' - one song then one other song - just to try to keep my hand in there, get back into the studio, refine those recording skills. The sound they produced was excellent. On a budget, I could afford one song, but to duplicate that onto a whole album was beyond my reach." In 2011 Matt got married to a young lady called Verity. It was quite an eventful year for the singer/songwriter as he also released another CD, 'A Deeper Longing: Acoustic Worship EP'. But it's the songsmith's latest recording, 2014's 'All Things New', which he believes to be his best so far. "I worked a lot on that, trying to get the songs more congregationally accessible. I worked with a great friend of mine, Ryan Baker Barnes, in Dudley on this. He's from Zimbabwe as well, so we've known each other from when we were both over there. 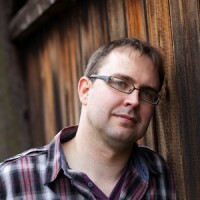 Ryan is the worship leader at Revival Fires in Dudley." Matt spoke about the songs on the project. "'Won My Heart' is a song I wrote with Ryan some time ago. He put a modern, almost like a Bethel Music feel to it: you've got this rhythmic beat going on the background - almost like disco/'God's Great Dance Floor' feel to it. 'Emmanuel' started off as a Christmas song. There is a Christmas verse out there if anyone wants to use it at Christmastime, but it's been altered slightly to be used throughout the whole year. That's taken on a more folk, Rend Collective kind of feel. There's some rock numbers, and a quiet one - I'm really pleased with 'Forevermore', which is a song for Communion." Intriguingly for such an experienced worship leader and songwriter, Matt isn't particularly comfortable with the phrase worship music. "I think it's quite unfortunate that a genre of music has been labelled as 'worship', because so many people can misunderstand what worship is: they'll think, 'Oh, worship equals this'. I've purposely tried to avoid using that language - especially when I'm on stage. I won't say, 'Let's enter into a time of worship' and then start singing; I'll say, 'Let's sing together', which is very different. Worship is more than that. If you look at the Bible, music is part of it - most definitely - and it can enhance things. It's great; I love music. But to think worship is the singing of songs just misses the mark so much." 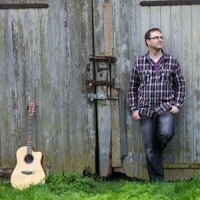 Worship leader Matt McChlery teams up with producer Phillip Goss for new album.